I’m a bit of a cheater. This month’s What’s Baking theme was “Baking with Fresh Fruit”. Rhubarb is a veg, but I’m going to go and act like it’s a fruit. 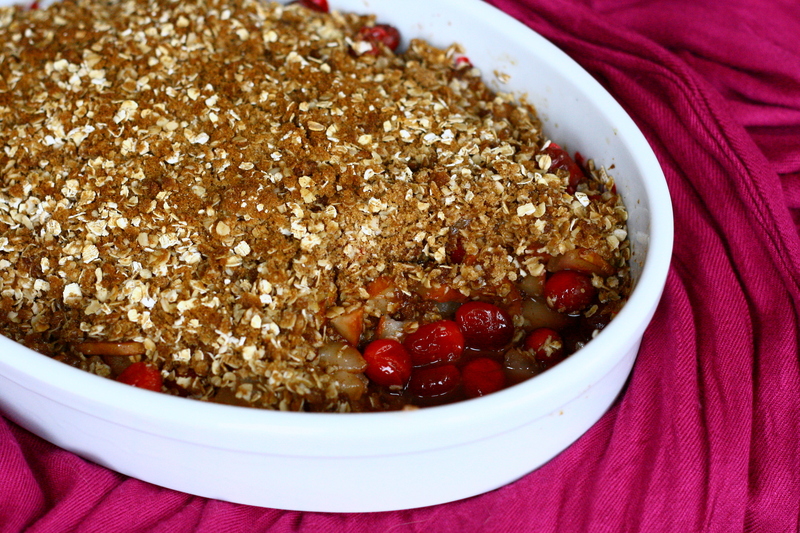 Because rhubarb is seriously one of my favorite things to bake with in the summer. Over the years, I’ve drifted towards a preference of rhubarb dishes that are a bit more in-your-face tart. The tartness of rhubarb is one of the reasons I love it so much. I’ve mentioned that I’m obsessed with sour candy, right? Rhubarb is nature’s sour candy and I can’t get enough of the stuff. Want to know how much I loved this? I served this during dinner with Mike’s family and instantly regretted it. I selfishly kept the leftovers to myself and managed to eat them before I crawled into bed. So, do yourself a favor and just make a double batch: one to share and one to keep for yourself. Or just keep both for yourself. Good food is meant to be shared, but really good food is meant to be hoarded and eaten in secret without the threat of someone swooping in to take a bite. Preheat oven to 350°F. Butter a 2 quart baking dish and set aside. To make the filling: In a large bowl, combine the rhubarb, crystallized ginger, sugar, 2 tablespoons oat flour, orange zest and juice. Stir until well combined. Spread filling into the bottom of the prepared dish. To make the topping: In a separate bowl, stir together the oat flour, oats, salt, cinnamon, brown sugar, and grated ginger. Using your clean hands, work in the softened butter until the mixture coarse crumbs the size of a pea. Spread topping evenly over rhubarb filling. Bake for 45 minutes to 1 hour in preheated oven or until filling is tender and bubbling and topping is golden brown. Categories: Cobblers, Crisps & Crumbles, Dairy Free, Dessert, Food, Gluten Free, Quick & Easy, Special Diets, Vegetarian & Vegan | Tags: dairy free, dessert, gluten free, quick and easy, vegan | Permalink. This crisp made its first appearance at Thanksgiving along with my favorite dairy-free iced pumpkin cookies. I’m hoping to make it again for one of the many Christmas meals I’ll be chowing down at. It’s super easy to throw together and it’s kind of pretty to look at. At first, I was a little disappointed that the cranberries didn’t all burst during baking, but it turns out that the whole berries are kind of fun to bite into. And the topping? Well, the coconut oil used in it is a million times better than butter. Trust me. Preheat oven to 350°F. Grease a 2 1/2 quart baking dish with melted coconut oil and set aside. In a large bowl, stir together pears, cranberries, honey, cinnamon and cornstarch until well combined. Pour into prepared baking dish. In a separate bowl, mix together flour, brown sugar, cinnamon, nutmeg and coconut oil. Mash with a fork until mixture is crumbly. Sprinkle evenly over fruit in the baking dish. Bake in preheated oven for 35 – 40 minutes, or until topping is golden brown and filling is bubbly. Remove from oven and let cool slightly before serving. Categories: Cobblers, Crisps & Crumbles, Dairy Free, Dessert, Gluten Free, Special Diets, Vegetarian & Vegan | Tags: dairy free, dessert, fruit, quick and easy | Permalink. I’ve finally given in to pumpkin. Pumpkin treats, that is. I suppose it’s that time of year – leaves are turning, it’s getting colder, days are getting shorter… there’s even a threat of snow around here. I love all things pumpkin except for pumpkin pie. Pumpkin cookies, pumpkin cheesecake, pumpkin cinnamon rolls… you name it, I’ll eat it. 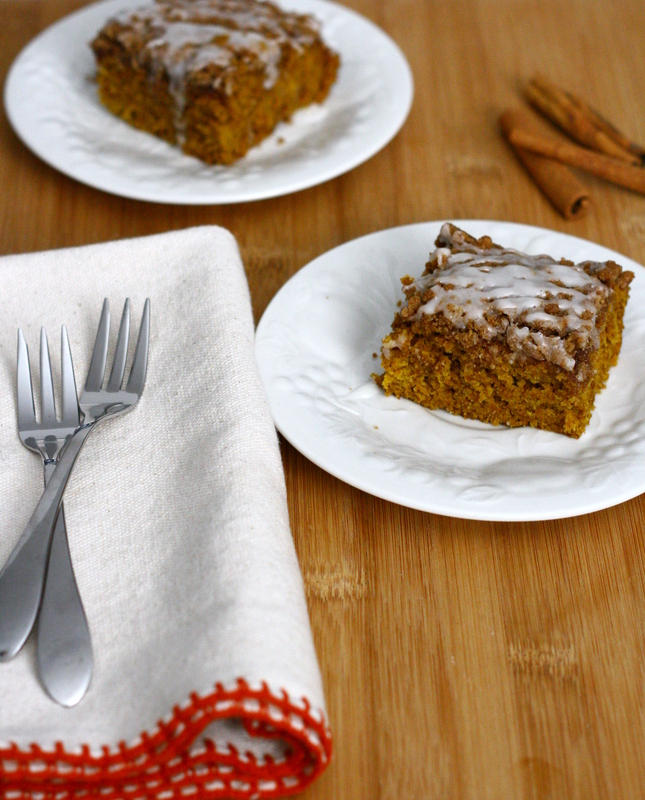 This pumpkin cake has won over my heart. It is definitely the pumpkin treat of choice for me. I will eat and eat and eat and eat until it’s gone. Seriously, it’s that good. 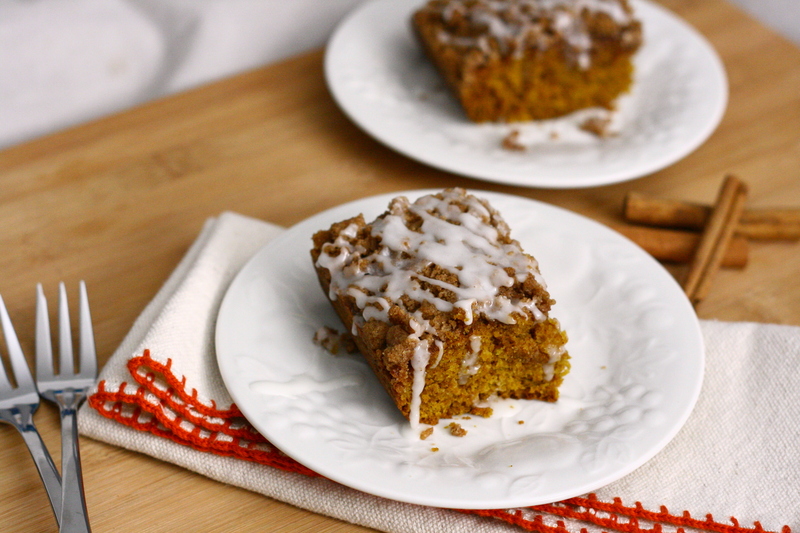 Pumpkin cake with a streusel topping and some icing – what can be better than that? Preheat oven to 350°F. Spray an 8×11 or 9×9 baking pan and grease with butter substitute or nonstick spray. Set aside. To make the streusel topping, combine flour, brown sugar, salt and cinnamon in a small bowl. Cut in butter with a fork, two knives, or a pastry blender until mixture is crumbly. Set aside. To make the cake, combine flour, baking soda, baking powder, salt, cinnamon, and pumpkin pie spice in a large bowl. In a separate bowl, whisk together pumpkin puree, brown sugar, oil, maple syrup and milk until well combined. Pour wet ingredients into the dry ingredients and mix until just combined, being careful not to over mix. Pour batter into prepared baking pan and use a spatula to smooth out the top. Sprinkle prepared streusel topping over the batter and gently press down into the batter. Bake in preheated over for about 30 minutes, or until a toothpick inserted into the center comes out clean. When cake is almost done baking, make the glaze. In a small bowl, combine the powdered sugar and almond milk and whisk until smooth. Drizzle over cake. Serve immediately, or keep at room temperature for up two three days. Categories: Bread, Muffins & Rolls, Cobblers, Crisps & Crumbles, Cookies, Dairy Free, Gluten Free, Special Diets | Tags: breakfast, cake, vegan | Permalink. Strawberry and rhubarb are the perfect combination. 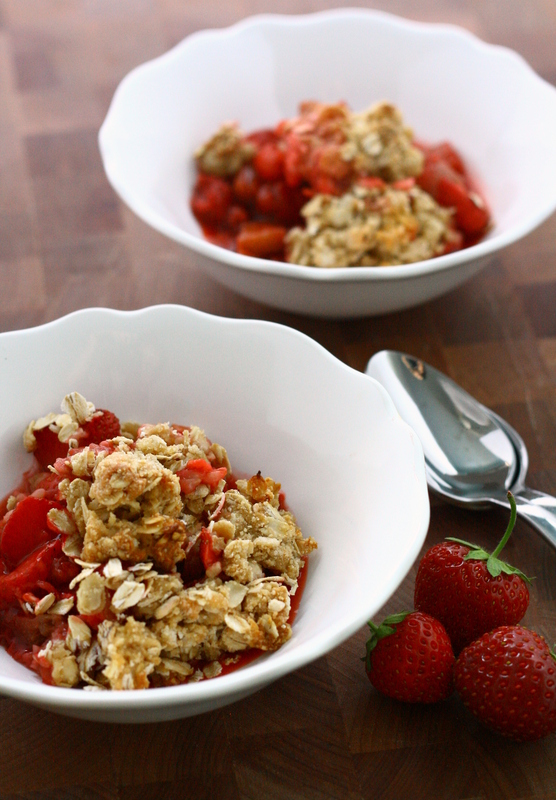 Fresh-picked strawberries and just-harvested rhubarb are even better. 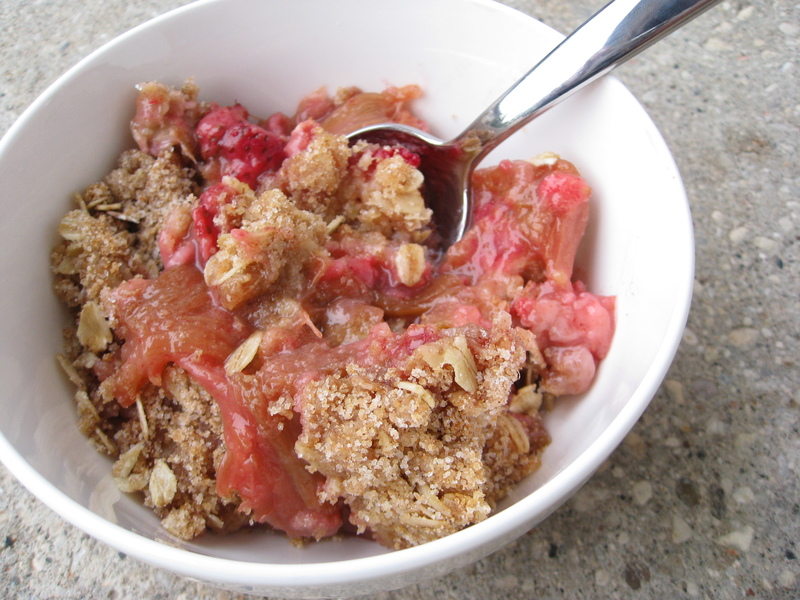 I always try to find new rhubarb desserts that don’t involve strawberries, but I can’t help but go back to an old favorite – strawberry rhubarb crisp. Some day I will branch out and try something new, but I’m in no real rush. Now look at all that goodness baked into a perfect crisp. Preheat the oven to 350°F. In a large bowl, mix together all the filling ingredients until well combined. Pour into a 13×9 baking dish. In a medium bowl, combine the dry topping ingredients. Stir in the melted butter and Greek yogurt until well combined. Place spoonfuls of the toppings over the filling. Gently break up the topping with your fingers or a spoon until it is well distributed over the top of the filling. Bake for 45 – 50 minutes, or until filling is bubbly and the topping is golden brown. Let stand 10 minutes before serving. Categories: Cobblers, Crisps & Crumbles, Dessert | Permalink. Summers as an adult aren’t quite as fun as summers as a kid. You don’t get 3 months off, you have responsibilities, and days during the summer feel just like days during any other season. Except hotter and less enjoyable to run in. I think this summer might be a less exciting than usual. Instead of just working, I have studying on top of it. 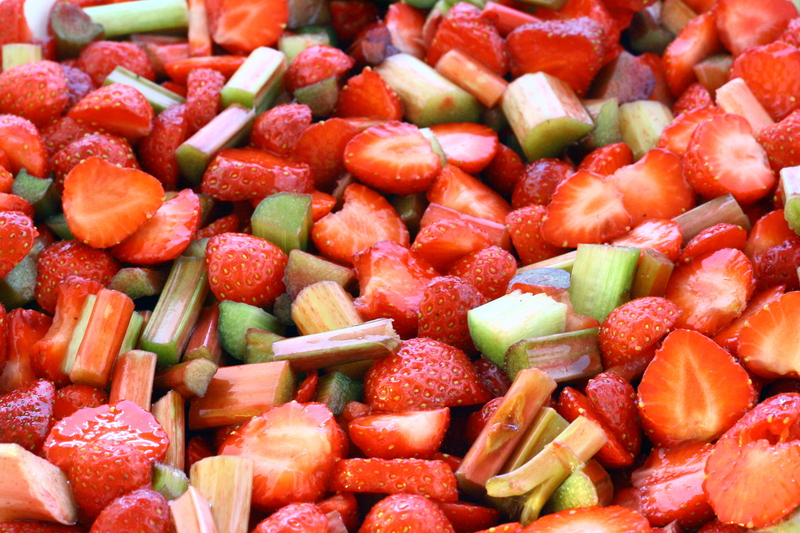 There is one thing that I will always love about summer though – rhubarb. Lots and lots of rhubarb. When Mike and I bought the house last year we transplanted a rhubarb plant. It looked so sad last year. It still looks sad this year. I hope next year it magically comes to life. Until then, I’ll be stealing rhubarb from my in-laws. When I peeked in our first CSA bag and saw rhubarb, I did a little happy dance. I knew it would be perfect paired with the strawberries my mom had picked and I couldn’t wait to bake something up. The recipe below was a first take on the crisp. I was a little unsure of how it would turn out, but it was pretty darn tasty! In the bottom of a 9 inch cast iron skillet, combine all filling ingredients. In a medium bowl, stir together all topping ingredients until well combined and sprinkle on top of fruit. 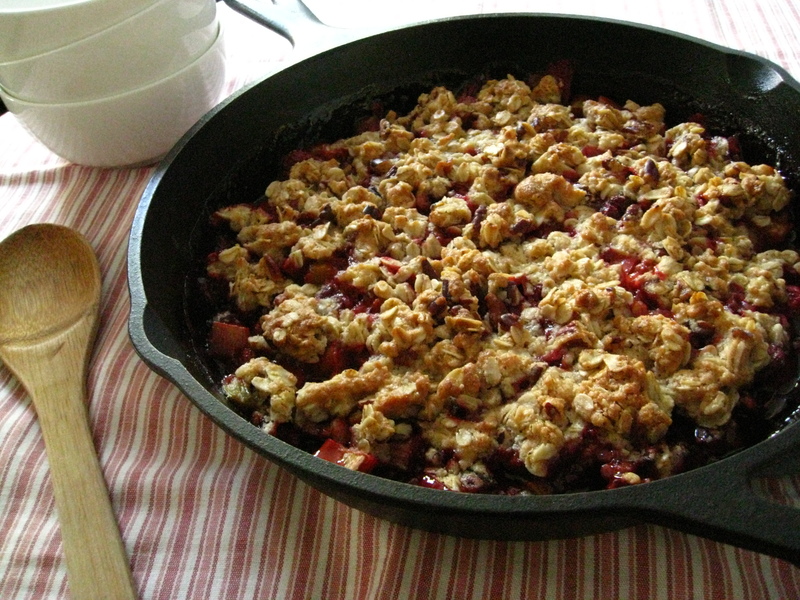 Categories: Cobblers, Crisps & Crumbles, Dessert | Tags: CSA, dessert, fruit | Permalink. 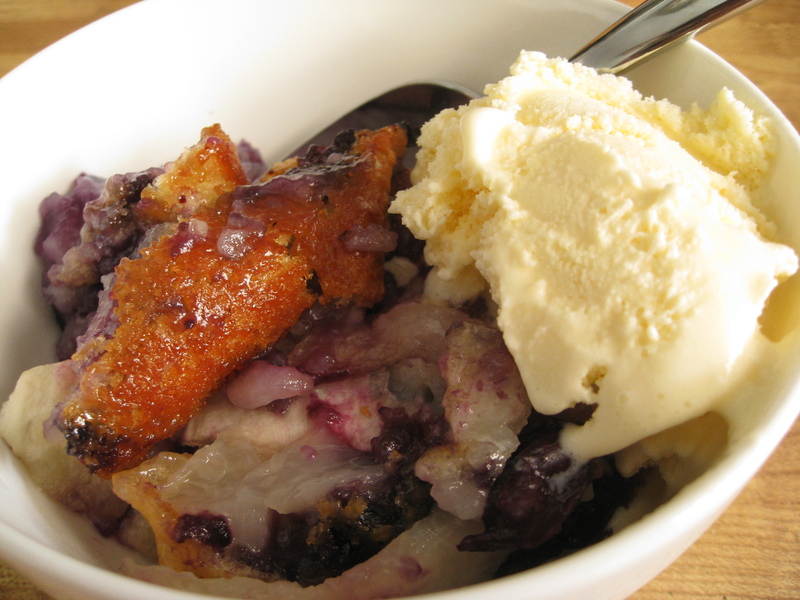 Cobbler vs. Ice Cream. Spoiler alert – ice cream wins. I tried my darndest to get a picture of the cobbler with a scoop of ice cream. For some reason, I thought I would be quick enough to get one photo of it before the ice cream turned into a puddle. I even tried taking the picture inside since it was a bit cooler. Darn. I quickly ran this plate out to my father in law before the ice cream turned to complete liquid and the whole dish became inedible. Then, I tried again. Eh, a little better. Food photography is obviously not my forte. Moving on… here’s the recipe! Preheat oven to 350ºF. Butter an 8×8 pan and set aside. Combine flour, sugar, baking powder, salt and cinnamon in small bowl. Add milk and butter, whisk until smooth. Pour into pan and scatter fruit evenly over batter. Sprinkle with 1 tablespoon of sugar. Bake until batter is a golden brown and the fruit bubbles, about 60 minutes. Serve warm with vanilla ice cream. 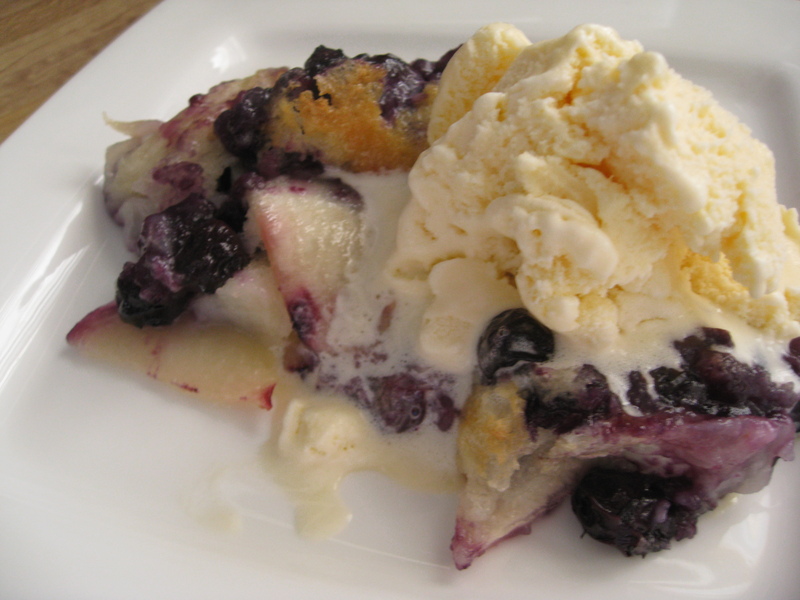 Categories: Cobblers, Crisps & Crumbles, Dessert | Tags: dessert, fruit, quick and easy | Permalink. I love fruit crisps. They’re pretty idiot-proof, meaning I don’t need to rely on a recipe to make it taste good. I was so excited to use the first batch of rhubarb that my in laws’ garden yielded*, especially since the rhubarb that we transplanted into our garden was looking pretty pitiful. I kept waiting for a nice day so I could take good pictures, but Wisconsin decided to rain on my parade. Literally. Our sump pump has been running 24/7 and our yard is a lake. We now have water-front property, folks. I love the simplicity of this recipe – it takes so little effort and time, and it’s so delicious! Mix filling ingredients together and let sit. Meanwhile, mix dry ingredients of topping together. Pour in butter and stir until large crumbs form. Pour filling into an 8.5″ square pan and top evenly with topping. Bake 40 minutes, or until done. Eat as soon as it’s cool enough to shovel into your mouth. 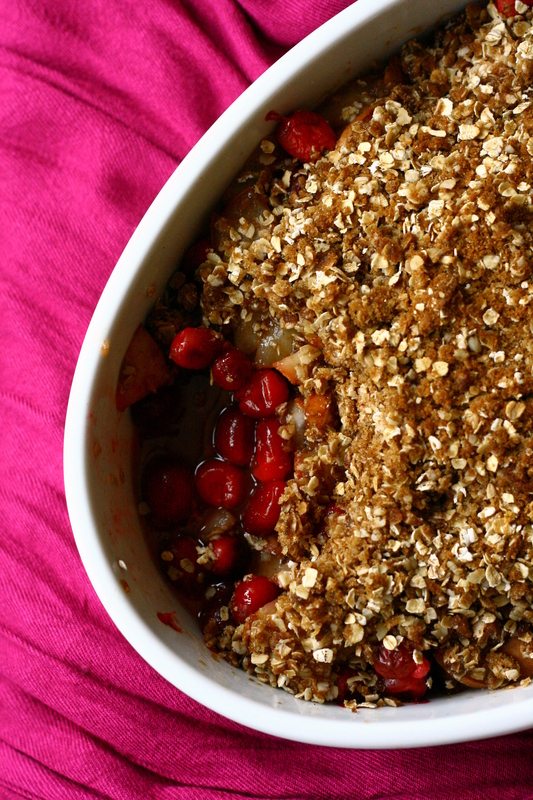 Categories: Cobblers, Crisps & Crumbles, Dessert, Quick & Easy | Tags: dessert, fruit, quick and easy | Permalink.